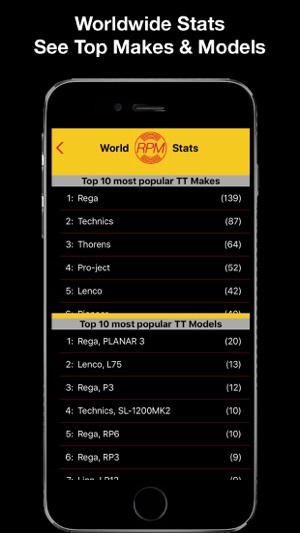 The best Turntable RPM accuracy test mobile app available. Full functionality, no ads or in-app-purchases. 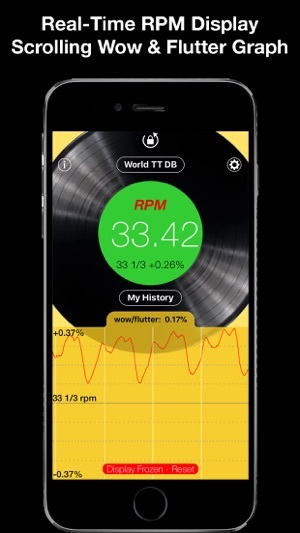 See the RPM speed variations, wow/flutter, of your turntable in real time graphics like you've never seen before, continuous display makes it easy to make adjustments as necessary if your turntable allows it. 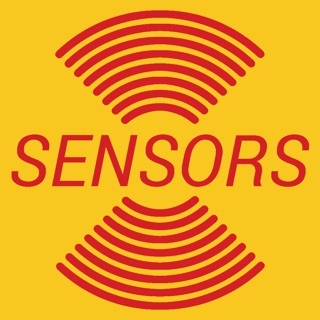 Test the RPM speed and wow/flutter accuracy of your turntable, whether 16, 33 1/3, 45, or 78. And now with the Worldwide RPM Turntable Accuracy Database you can research what other RPM users are finding out about their turntable's accuracy and what they think of them. ● RPM is proud to be recommended by Rega Research Ltd, makers of some of the best turntables in the world. See the wow/flutter accuracy as the max % deviation from the average rpm of the turntable, as well as graphically in the chart. 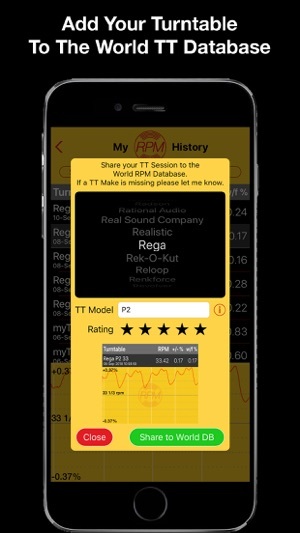 Save all your rpm test sessions to the history log for review or sharing later. 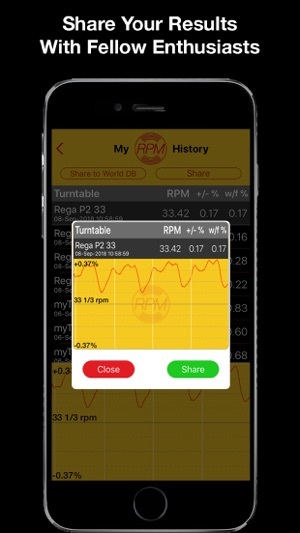 RPM uses the gyroscope in your iPhone to determine the rotation speed of your turntable, automatically determines which speed setting you're on, and reports how accurate it is. Simply place your iPhone on your turntable, close to the centre but doesn't have to be over the centre spindle. As the iPhone rotates the display will remain stationary from your perspective for easy reading. The UNIQUE feature of RPM is that it shows a scrolling graph of the rpm accuracy variation over time, this shows wow/flutter effects, especially those associated with the turntable not being level, belt wear, etc. You can even detect the small drag caused by the stylus resting in the grooves of the record. 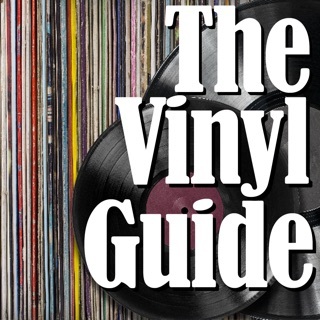 The most recent amazing new innovative feature is to visualise wow and flutter variations plotted around the vinyl centre to show a heat map of exactly where in the turntable rotation inaccuracies occur. There are many ways of testing the average RPM of your turntable, some turntables even have this built in, however there is no other practical way of showing the wow/flutter variation over time than RPM. - Set the moving average sample size. - Accuracy at which to turn the rpm circle sold green. - Set a duration after which the display updates will freeze so they can continue to be read after the turntable is stopped. 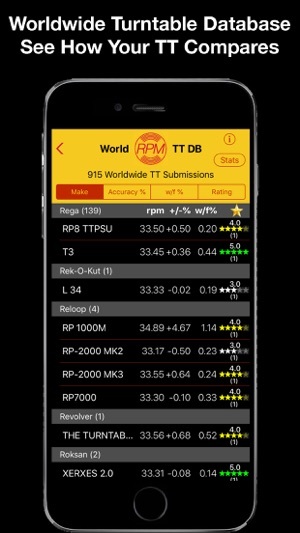 The RPM realtime display is reliant on the iPhones gyroscope accuracy, if you suspect yours isn't quite right then you can now use Calibration Mode to auto test and then apply any necessary correction in real time. This auto calibration uses the compass to count the turntable revolutions, if you have an older iPhone (not iPhone 6S or newer) then this may be unreliable, in this case you can still add your own multiplier if you have done an independent calibration. 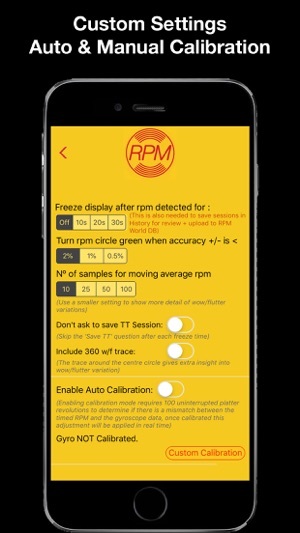 Extensive testing means we're now confident that using RPM can help you setup your turntable to be within 0.1% of its target RPM, assuming your turntable can be adjusted and is itself stable within that tolerance of course. 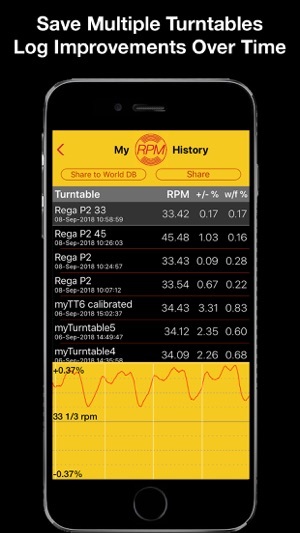 V3 brings The World RPM Turntable Performance Database, accepting submissions from RPM users worldwide to build the ultimate resource for researching the most accurate turntables out there. Upgrade to join in and upload your own turntable data, go to Settings and make sure you have the Freeze time set then do an RPM session as normal. At the end of the time you will be asked to name your session after which you will have the option to also upload it to the World DB. You can always upload from History later too." Until - time to / from events. Lissajous Play - Maths Art!